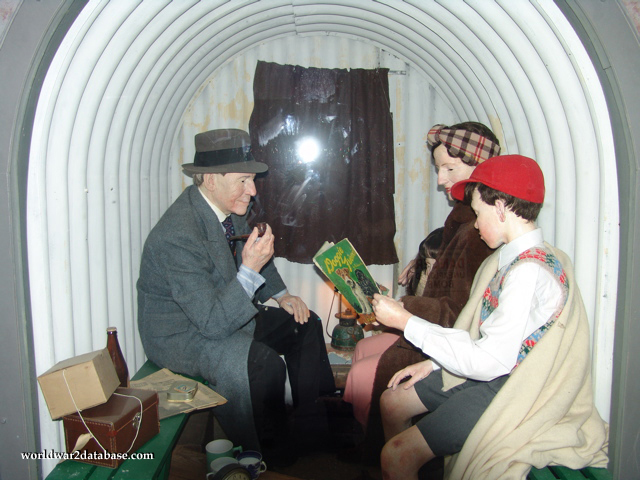 The Anderson Shelter was used by scared civilians in September 1939 every night, but soon when air raids weren't immediately apparent they shunned the cold and wet structures during the Winter of 1939. But by September 1940, they were occupied almost every night, with families stocking them as they saw fit. Instructions for putting up beds and against toliets (for sanitary reasons) were printed in the newspaper and distributed to homeowners. However with the heavy bombing in some areas most Anderson Shelters had a bucket for personal use. They also stocked nonperishable food, reading materials, and perhaps a torch or lantern, which coudln't be used during the blackout. IWM Duxford's family hasn't constructed beds, but seem relaxed as they wait for the all-clear siren. During the nighttime raids they probably couldn't read without some light.